Home » Posts » Civilian Education » Military Training to College Credits – Find Out How! Your AARTS transcripts can be turned into promotion points in a matter of weeks. They can be converted into college credits; which then are worth civilian education promotion points. You already did the training; the hard work is over. Now, all you need to do is the paperwork. It’s actually not very difficult and I will walk you through the entire process in this article. Depending on how long you have been in the Army and how much training you have down, you could get up to 75 extra promotion points. I know my BCT and AIT training alone got me 35 promotion points. Your AARTS transcript is your record of everything you have learned in the Army. It includes training you have graduated from like BCT, AIT, WLC, etc. It also includes courses you have taken online through Skillport, ALMS and many others. If you are familiar with Army transcripts, you may know of AARTS or Army/American Council on Education Registry Transcript System. This is not longer your point of contact to receive or order your transcripts. AARTS has been replaced by the Joint Services Transcripts (JST) system. The new system is extremely easy to use and gets things done fast; much better than AARTS. Send that college your AARTS transcripts. Receive your new official or unofficial college transcripts. Take your unofficial college transcripts to the education center to get a promotion point memo. Take that memo and the unofficial transcripts to your S1. If you received official transcripts in step 4, you may skip step 5 and go straight to S1. There are a ton of colleges that claim to be “military friendly” and give college credits for your military training. However, the one thing they want is money. 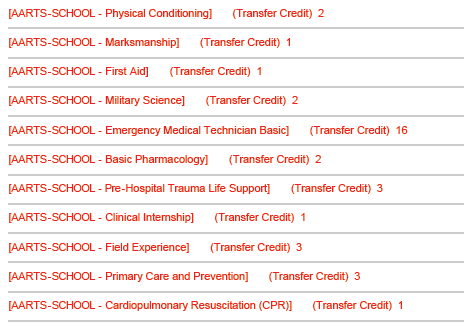 None of the schools that are well known for converting Army transcripts to college credits are what they seem. Through my research, I found that they wanted you to pay an admission fee, transcript evaluation fee or a fee based on the amount of credits they awarded you. This is just a ridiculous way to get money from soldiers and it is not right. I personally have used this school to do my credit evaluation, my husbands, and many friends. I did not pay one single cent. It is completely free for military members to apply, get a transfer credit evaluation and unofficial transcripts. If you take courses with them, you can then get official transcripts. But, the unofficial transcripts work just fine for getting promotion points. Fill in all the information as directed and create a log-in and password. The website guides you through the process. Make sure to state that your are in the military; active or reserve. This is how it is free. You will be automatically accepted as soon as you finish the application. Go through the “orientation”. It just goes through all of their policies and how to use their site. There is no need to actually read it all since I am walking you through the process. Just keep pressing “next” until you get through it all. Fill out the Transfer Credit Evaluation request form (TCE). The link to it will be on the left side of the main page when you are logged in. Make sure to choose that you have AARTS transcripts to be evaluated. Send your AARTS transcripts to the school with JST. Click “APUS transcript orders” on the left side of your screen under the “Forms Menu” heading. Click “Degree Progress Report”. This will open your evaluation in another window. Print it and save it on your computer for your records. This is your unofficial college transcript. Go to the Joint Services Transcripts site. Log in with your CAC card on the left hand side of the screen. Enter “American Public University System” into the school search phrase and click the result with an address of “10110 Battleview Parkway”. Check the box on the next screen to agree to the consent statement and click “yes”. Print your confirmation page. Since Army transcripts are delivered to American Military University online, they should arrive the day after you have them sent. Once the college has received your AARTS transcripts from JST, they will take about 2 weeks to evaluate. As soon as they have finished, you will get an email saying that your Transfer Credit Evaluation is complete. You now need to log onto your account and print the unofficial transcripts in steps 12-14 above. Once you have those in hand, follow the steps below to finish the process. Take your unofficial college transcripts to the education center on your military installation. Inform them that you need a memorandum for promotion points. You will be given a short paper to fill out, which a counselor will use when they make your memorandum. This will take a few days to a week depending on how efficient the education center is. They will call you when it has been finished. Pick up your memorandum from the education center. It will be stapled to your unofficial transcripts for reference. Take these to your S1 and tell them you need to update your ERB. From here you have done all you can. You now wait for it to show up on your ERB and it will automatically populate on your Promotion Point Worksheet (PPW) as well.